Raphael was the contact for obtaining the keys. He works in a restaurant he owns across the street so he was very accessible and is not local so he speaks perfect English (I think he is English actually). The unit has no air conditioning, but I admittedly didn't look for that when I booked. The unit is located on the second floor with no elevator on a side street that is centrally located. Honestly, I can't think of a more centrally located place to stay. The unit has a washing machine that we used and it worked well (no dryer). The location was both a plus because it was centrally located and a minus because it was centrally located across from a restaurant. We needed to store our luggage and Raphael was more than accommodating. The location was perfect. Less than a 5 min walk to city center. Close to dozens of restaurants and bars.comfortable and the coffee machine is amazing. The appartment was well equipped with a nice kitschen. Apartment was spacious, comfortable and clean. The location to everything was excellent and within walking distance, even Mirabelle plaza for public and tour transportation. amazing location in amongst all the shops and bars and next to the river. Shrimps Restaurant opposite was fab and so was the cocktail bar a few doors along. Everywhere was in walking distance. Location of the apartment is very good. Kitchen very well equipped and was good to cook. Note, this review was done by my wife and her friend. They were in the apartment and gave this feedback. Very well recommended the apartment. Location was great and the apartment had heaps of room. The kitchen was well stocked for self catering. The apartment was in the BEST location. I had read reviews to say it was a little noisy. I can say we stayed over New Year and we didn't find it noisy at all. There was always a 'hum' but that happens in a busy city. The kitchen/lounge room is very large. The bedroom a little on the small side, but perfect. Close to everything. Highly recommend. The apartment was in the best area of Salzburg and it was a really great apartment - very comfortable and clean, with a washing machine and a fully equipped kitchen. Daniel, the person who brought us the keys, was very nice. Lock in a great price for Easyapartments Altstadt 1 – rated 8.4 by recent guests! Located in Salzburg´s city center and only a 1-minute walk from the Mozart's birth house, Easyapartments Altstadt 1 offers a good starting point to explore the Old town. All famous landmarks are reachable within a walking distance. Fully equipped Easyapartments Altstadt 1 comes with a bedroom and a living room with an open-plan kitchen. A dishwasher, dining table, coffee machine, microwave and children´s high chair are provided. A seating area is furnished with a sofa and a flat-screen TV with cable channels, iPod dock and a DVD player. A private bathroom is fitted with a shower, a hairdryer and a washing machine. Many restaurants, bars and shops in the famous Getreidegasse Street can be found within only 2 minutes on foot. The apartment is located just a few steps from the Salzach River and a 5-minute walk to the Salzburg Cathedral. The Festival House is reachable within 1,000 feet. 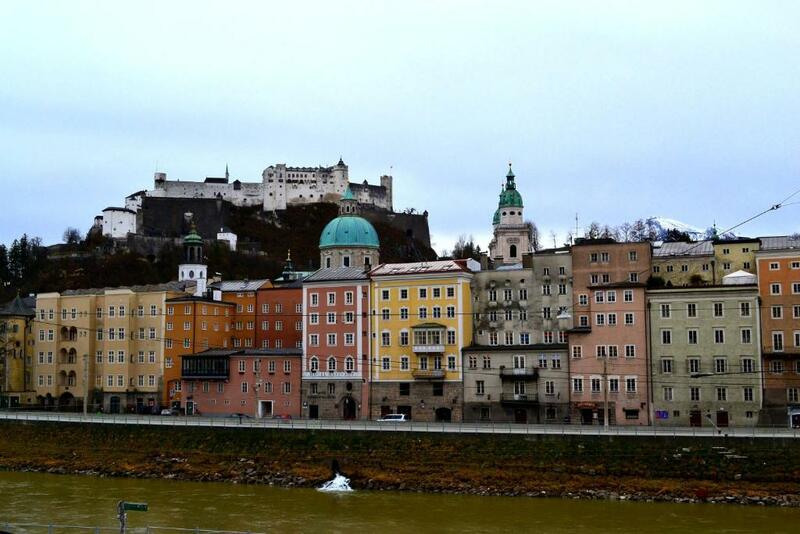 뀐 Located in the real heart of Salzburg, this property has an excellent location score of 9.4! When would you like to stay at Easyapartments Altstadt 1? This apartment comes with a bedroom and a living room with an open-plan kitchen. A dishwasher, dining table, coffee machine, microwave and children´s high chair are provided. Area Info – This neighborhood is a great choice for travelers interested in culture, history and atmosphere – Check location Excellent location – show map Guests loved walking around the neighborhood! House Rules Easyapartments Altstadt 1 takes special requests – add in the next step! Please inform Easyapartments Altstadt 1 of your expected arrival time in advance. You can use the Special Requests box when booking, or contact the property directly using the contact details in your confirmation. The bed could be higher! bit of noise from the bars opposite on the Saturday evening, but not enough to make a difference to our stay. Bed is quite close to the wall - a bit uncomfortable and bed-sofa had problems. A large apartment that is close to all major attractions. The restaurant across the street caused there to be patrons outside after we went to bed, but even with the windows open, that did not keep us up as they were pretty quiet. What did wake us up with the absolute smashing of hundreds of glass bottles by the garbage men at 5:30am the first morning and closing the windows was not an option since it was so hot. The second morning, the garbage men didn't arrive until 7:30am and we were already up thankfully. Receiving the key. There was a miss communication and we waited for nearly 2 hours outside the apartment to get our key. It would be nit picking, but the bed slightly small - my partner is 190cm and feet didn't quite fit in the bed. The shower and bathroom on the small side for the same reason above. But for a short stay it was very comfortable. 1. Although I informed the host about my exact arrival time per e-mail, per sms and per phone, there was nobody there when I arrived with 3 little kids who needed to go to the toilet after a long and tiring journey by car. I had to call and then wait 25 minutes for someone to arrive and bring us the keys. 2. There was no wi-fi at the bedroom, only at the living room. Also no elevator. 3. The buiding next door was being rennovated (for the last year!) and we had to wake up early in the morning by the jackhammers beside our ears. There was also noise from the bars on the street at night - but that didn't really bother us. 3. We were obliged to check out at 10 in the morning and we were told that there was no place to leave our luggage for a few hours, so we had to carry around the city 5 suitcases. 4. In the apartment instructions we were warned that if he didn't leave the apartment super tidy (all the glasses, plates etc washed) we were going to pay 50 Euros for the cleaning of the apartment after we left - something that wasn't stated on the site of Booking.com. Security door to the appartment was missing and we could not find the promised safety box. Noisy at daytime due to ongoing work on nearby property. Light above the cooking space not working. It was a pity the washing machine didn't work .... They are getting a new one ... soon. The location was great. The kitchen has everything, dishwasher, microwave, full size oven and hot plates, coffee machine and large fridge. The bed comfy but why so low?